The Stories behind the boats — Eagle Island, Inc. The rain that had persisted for three days finally let up for Dedication Day held at Eagle Island on August 18th, 2018. Visitors began arriving at 11:40am and were welcomed by scores of volunteers, both those living and working on the Island at the time and others visiting for the day. 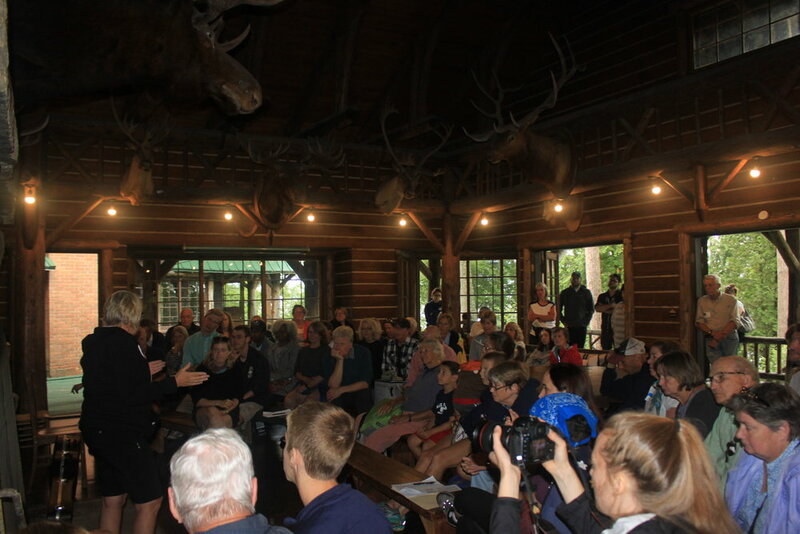 In total more than 130 people came to celebrate and honor many extraordinary individuals and their unwavering dedication to and support of Eagle Island. Many attendees picnicked in the Dining Room, Mariner Rock and other locations while others toured the Island, saw the many work projects in progress and visited the boats on the waterfront sporting their new names freshly applied to their transoms. Some visitors had never been to the Island, but came for the day to honor family members and friends. The values of this camp instilled self-confidence, adventure, love of nature, the fun of working together, and independence – they are at the heart of what makes girls into competent, capable women. Jeanne died in 2010, but her husband and friends knew of her love of Eagle Island and have contributed significantly in her memory to help with the restoration of the Mariner Boathouse where Jeanne’s plaque will reside. Gwen Graves Shupe presented a plaque for her great grandmother, Florence Graves, that will hang in the old part of the Dining Room along with the plaque for Henry, Jr. & Florence Graves presented last year on the 80th anniversary of their gift of the Island for children. After further research, it is understood that Florence was likely the driving force behind the Graves’ gifting of the Island to the Girl Scouts in 1937. Gwen found it a serendipitous joy to spend part of the weekend scrubbing the walls of her grandparents’ summer home. Lauren Parmington, EI Vice President, introduced the new Mercury Sailboat Fleet by speaking about Mimi Harrington, her beloved friend and our esteemed Vice President who died suddenly in October 2016. Mimi’s family donated the fleet in Mimi’s memory. Her husband, Peter Gow, spoke about Mimi as well as her sister, Zella, who was also a proud Eagle Island alumna. 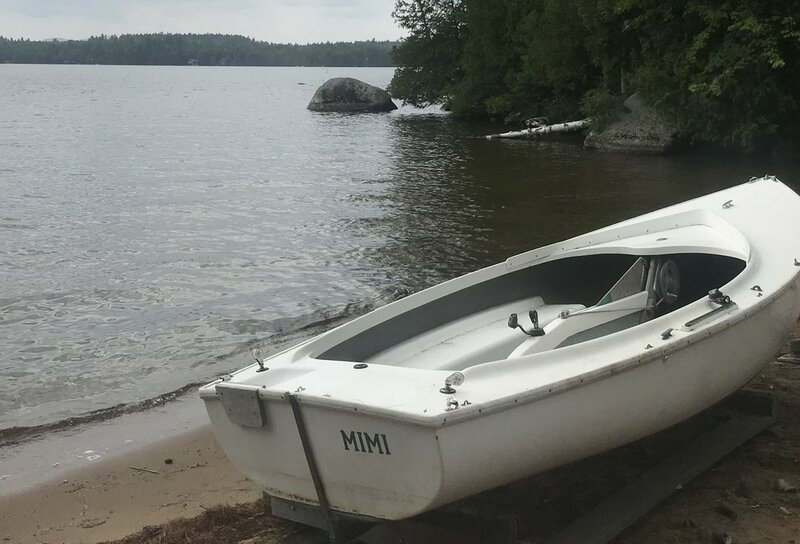 Mimi was a inspiring teacher year-round: in the summers as an Eagle Island sailing counselor and camp director and during the rest of the year as an elementary school teacher at Dedham Country Day School in Dedham, MA. She was a uniquely powerful force in moving the restoration and reopening of camp from a dream to a realizable project. When Mimi’s family donated the fleet of six boats, two were to be named for Mimi and Zella. Peter encouraged EI to raise many thousands of dollars for restoration projects by offering the naming rights to the other four boats. Zella Harrington was also a lifelong educator and taught home economics and related subjects for many years at Holyoke High School and later at Amherst Regional Middle School and High School. A lifelong member of the Daughters of the American Revolution, Zella was also active in the Amherst League of Women Voters and served several terms as a Town Meeting member. For many years she was on the board of the Little Red Schoolhouse in Amherst. Travel, the French language, gardening, sewing, quilting, and family history were at the center of Zella's interests, and she credited the beginning of her lifelong loves of music, sailing and canoeing to her experiences as a camper and later a counselor at Eagle Island. 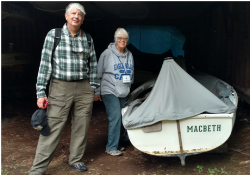 The MacBeth is named in memory of Beth Rosengarten Rubin, a Mariner in the 1950s. Lifelong friend Chris Hildebrand explained that Beth was the Friends of Eagle Island’s first editor who wrote and reviewed press releases, letters, media coverage of our efforts and much more. Funds to name the boat came from her family and EIC and Columbia High School friends. Mac Bogert, Beth’s longtime partner, performed with his guitar and beautifully sang one of Beth’s favorites, Since I Met You Baby, in her honor. Kathi Quigley Treondle spoke about her beloved EIC and high school friend Emily (Jo) Novick who died in 2012. Like so many of us, she credited much of her character formation to her years at Eagle Island from Campcraft (1959) through Mariners (1964). Emily’s memorial meeting in 2013 was attended by over 600 people including Kathi and many EIC friends – a tribute to her lifelong friendships and human rights efforts as an attorney and also as a Judge on the Massachusetts Industrial Accident Board. Ginny Hildebrand spoke about her sister, Chris Hildebrand, EI Board Member, for whom her family has donated towards the naming of one of the fleet. Chris was a much loved Mariner and Mariner counselor in the 1950s and 1960s. According to her campers, Chris’ passion for Eagle Island and for sailing was something she couldn’t help but share. An outstanding teacher, Chris instilled in Mariners the desire and confidence that they too could learn to sail the tricky, windy waters of Upper Saranac Lake. When it looked like Eagle Island was in trouble (as far back as 2006), her desire for future generations to share EIC propelled her into action as the very first “save Eagle Island” activist. Today she continues to tirelessly contribute in her role as EI Communications Coordinator. Juli Graber Greenberg spoke about why her family raised money to ensure a sailboat would be named for her mother. Marilyn was a camper in many units including Mariners in the 1950s. Later, as a mother, she made sure that the extraordinary experience of living on Eagle Island would become a part of her children's lives. She brought her husband, son and daughter, neighbors and other friends to Family Camp year after year. These summer weeks became influential to her children's characters and for this they are filled with gratitude. Today, Marilyn and Juli are active leaders of our volunteer Fundraising Committee and are working diligently to reopen Eagle Island. Rowain Kalichstein, a longtime supporter of Eagle Island, was the last speaker and introduced the Mama Ginny II, named for Virginia Hildebrand.. Virginia came to EIC as a Maplewood, NJ Mariner Scout leader who thought she and her scouts should learn how to sail. In her mid-40’s, she was the oldest “camper/counselor” on the Island. She came for three weeks to be with the Mariner unit from 1959 to 1962 and earned her “Skipper” sailing rating. She bought a Blue Jay sailboat, which she loaned to EIC for many years and donated to the Mariner fleet in the mid-1960s. When Eagle Island needed a barge in 2009, her former campers and NJ Girl Scouts raised the money to buy it and the barge was Mama Ginny in herhonor. Last year, Eagle Island, Inc. sold Mama Ginny to help purchase a much larger barge needed for restoration work and ongoing camp operations and named it fittingly Mama Ginny II. Susanne Banta Harper’s camp name in the 1940s was “Squirrely,” so it was a fitting name for the Phantom sailboat she and her family donated. She loved EIC so much that she sent her daughters and then later a granddaughter to Eagle Island as well. Also a dedicated Girl Scout leader, Susanne worked to keep Eagle Island from being sold back in the 1980s, proposing programming to expand the use of the Island: women’s weekend, family camping, and organizational use of Eagle Island for camping experiences. She promoted diversity as a goal, and sought opportunities for girls in urban communities to experience camp. Susanne is a retired high school history teacher and a published author for children and adults. Susanne’s legacy and love for Eagle Island will live on for the girls who learn to sail on the Squirrely. After the dedications, we sang Green Trees, Peace and Taps. Many attendees then continued to the beach where Lauren and Mimi’s sons Nat and Will christened the Mimi with champagne. Lots of pictures were taken and memories shared and a great day was had by all.